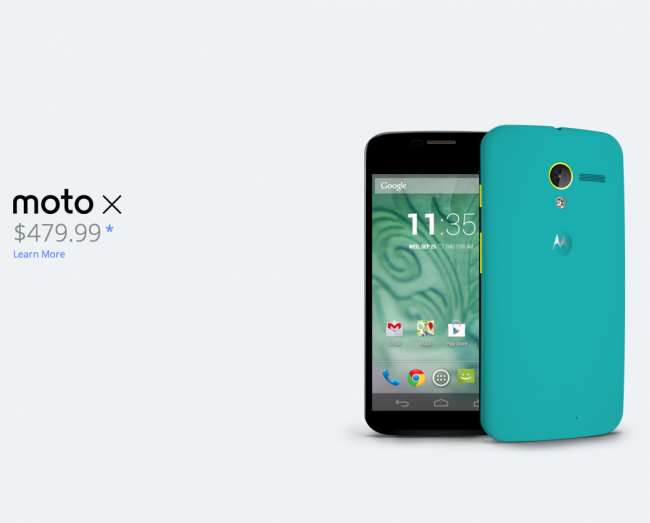 At the end of last week, Motorola dropped the price of on-contract MotoMaker-designed Moto X devices by $100 to $99 (16GB) and $149 (32GB). Initially, the off-contract or full retail prices surprisingly remained at their original $579 and $629 points, which seemed like an odd move. Thankfully, that has now changed. If you were interested in a custom Moto X but weren’t ecstatic about signing up for 2 years of service with AT&T and also wanted a price drop, get your credit cards ready. The Moto X can now be had at full retail for $479 (16GB) and $529 (32GB). I don’t want to call those Nexus-like prices, but a flagship-type phone at under $500 off-contract is a pretty damn good deal. Couple that with the fact that you can design it at no extra cost and you’ve got one of the better tech packages around. Any takers? Or are you now holding out for the Nexus 5 unveiling?